Please Note. Our complimentary shuttle service is available daily from 6am to 10pm. 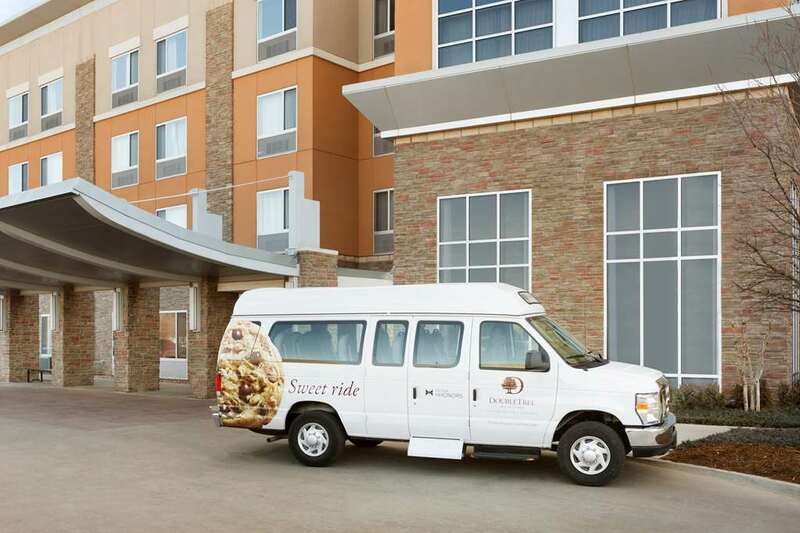 Arrive to a warm welcome at the conveniently located DoubleTree by Hilton Hotel Oklahoma City Airport where you*ll be greeted with a signature DoubleTree chocolate chip cookie. Relax in spacious accommodations and enjoy close proximity to travel links vibrant attractions and prominent corporations including AT-T UPS and Dell. Take advantage of the complimentary airport shuttle service free parking and guest rooms that have been designed to cater for business and leisure travelers alike. Experience Oklahoma*s rich culture and history by visiting one of the many local attractions situated close to our contemporary Oklahoma City Airport hotel. Unwind in a spacious guest room featuring amenities designed to help you relax and stay productive. Work at the ergonomically-designed desk and check emails with complimentary WiFi. Families can enjoy all the space they need in one of our corner suites. Watch a movie on the flat-screen TV and order a tasty snack from our room service menu. Alternatively join us for some breakfast or dinner at the hotel restaurant where you can choose from a varied menu offering many delicious meal options. Feel motivated with a morning swim in the pool or work out in the fully-equipped Precor fitness center. Host a meeting or conference with 1000 sq. ft. of event space equipped with contemporary A/V technology. Ensure your delegates don*t go hungry by allowing us to cater the event for you. Our hotel*s close proximity to Will Rogers World Airport means that gathering everyone in one place can be effortless.